NOTICE: Requires the base game Crusader Kings II in order to play. Activation key must be used on a valid Steam account, requires internet connection. ABOUT THE GAMEFace up to the toil, struggle, pain, strife and hardships of leadership in the latest expansion for Crusader Kings II. Developed by award winning Paradox Development Studios. The latest iteration to the franchise follows in the prou… d tradition of introducing defining new game elements to the narrative. 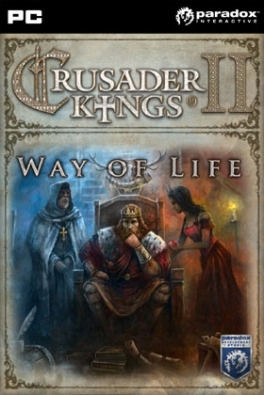 Crusader Kings II: Way of Life allows you to live life the way you like, be it as a peaceful mystic, a family man or a master of war. Each chosen focus will tell a different tale and presents an opportunity to forge your path to success by setting your focus and shaping the destiny of your empire. KEY FEATURES Set a Focus (a way of life) for your character to give them an immediate skill boost, develop their abilities and determine the kind of events and decisions they tend to get (there are ten of these focuses: Rulership, Business, Hunting, War, Family, Carousing, Seduction, Intrigue, Scholarship and Theology.) Hundreds of new events and 20 new images. Many new diplomatic interactions (Duel, Seduce, Banish to Monastery, Break up with Lover, etc) SYSTEM REQUIREMENTS Windows: Operating system: XP/Vista/Windows7 Processor: Intel® Pentium® IV 2.4 GHz or AMD 3500+ Memory: 2 Gb RAM Hard disk space: 2 GB Available HDD Space Video: NVIDIA® GeForce 8800 or ATI Radeon® X1900, 512MB graphics memory required. Resolution at least: 1024*768 Sound: Direct X-compatible sound card DirectX®: DirectX 9 Controller support: 3-button mouse, keyboard and speakers Special multiplayer requirements: Internet Connection for multiplayerMac: Operating system: Mac OS X 10.6.8 or later Processor: Intel Core Duo Processor (2GHz or better) Memory: 2 GB RAM Hard Disk Space: 2 GB Video Card: ATI Radeon HD 6750 / NVIDIA GeForce 320 / NVIDIA GeForce 9600 or higher Controller support: 3-button mouse, keyboard and speakersLinux: OS: Ubuntu 12.04 LTS Processor: IntelR PentiumR IV 2.4 GHz or AMD 3500+ Memory: 2 GB Hard disk space: 2 Gb Video Card: ATI Radeon HD 6750 / NVIDIA GeForce 320 / NVIDIA GeForce 9600 or higher, 1024MB graphics memory required. Controller support: 3-button mouse, keyboard and speakers	Paradox Interactive, CRUSADER KINGS® Copyright©  Paradox Interactive AB All rights reserved.